In the previous post we discussed the absolute basics of a Node web application. It really didn’t have a lot of functions: it listened to every single incoming request and responded with some properties of the request. We also come to the conclusion that those functions were quite limited. We have no routes, no controllers, no nothing, so working with code on that level is really cumbersome. In this post we’ll discuss the package manager of Node i.e. 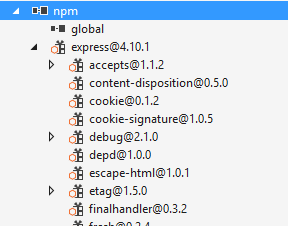 the Node Package Manager npm. We’ll also go through the basics of Express.js which is a web framework built on top of Node. We’ll build upon the CustomerOrdersApi so have it ready in Visual Studio – or in the IDE of your preference. You can write Node.js in Notepad if you wish, but Visual Studio provides some extras, like debugging, break points, intellisense etc. 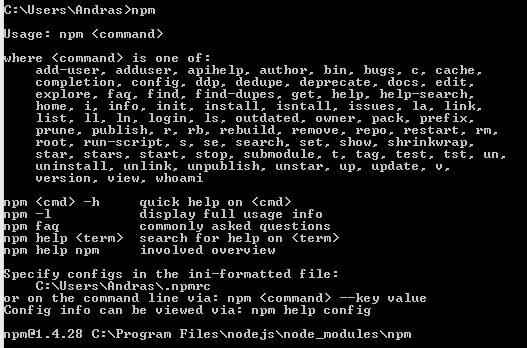 npm stands for Node Package Manager. It is the Node.js equivalent of NuGet in .NET and Maven in Java. It is a tool for managing dependencies that are not part of standard Node.js. E.g. the “http” package we saw previously is included by default so we didn’t have to import it. There are a number of packages that are not installed by default and they need to be imported if you need to use them. The imported packages will be referenced in the file called package.json, visible in the above screenshot. This function of package.json is similar to pom.xml in a Java Maven project and packages.config in .NET. The dependencies in package.json will be read by the IDE and install the necessary dependencies after opening the project for the first time. This is valid for Node.js, .NET and Maven as well: it’s not necessary to send the dependencies around to other developers. You can upload the project and package.json to a central source, like SVN or Git. Another developer who downloads it from source control can look into package.json and install the dependencies or let Visual Studio take care of it automatically. So what external libraries are available? This site lists all of them. Packages are referenced by names such as “grunt”, “express” or “underscore”. However, what’s that “not listed in package json” about? Open package.json and you’ll see nothing about dependencies there, right? This means that you can use grunt in your project but other developers won’t be aware of it just by looking at the package.json file. They will see some reference to it in the code, like request(‘grunt’) and then they’ll need to fetch the dependency via npm themselves. Grunt will silently disappear from the project. 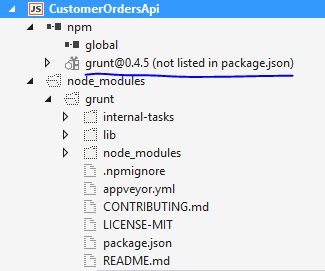 Search for “grunt”, click on the package name to select it – the present version of grunt is 0.4.5, you might see something higher – and then click “Install package” leaving all other default values untouched. Grunt will be installed again. If you right-click npm again then you’ll see options like “Update npm Packages” and “Install Missing npm Packages”. These do exactly what’s expected based on their descriptions: update installed npm packages and install any missing ones based on the package.json file. So another developer who downloads your project can simply run these functions to get the necessary dependencies. 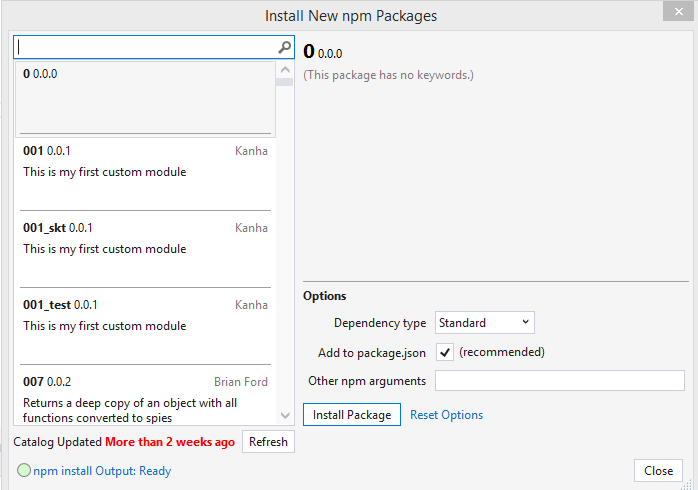 If you right-click the grunt pckage under npm you’ll be able to uninstall it by selecting “Uninstall npm package(s)”. Now that we have installed Express.js let’s use it. We’ll go through the statements first and re-write server.js at the end. The application doesn’t do anything yet but this step was necessary to have Express drive our web app. The above code ensures that we respond to GET requests to the root of the web app which is “/”. Run the application and you should see the message in the browser. You can test other URLs, such as /index, they won’t work, you’ll get an exception message on the screen saying like “Cannot GET [url]”. The writeHead method was replaced by the set method. Also, note the lack of apostrophes around the JSON object, i.e. we’re not specifying the JSON as a string. Re-run the app to make sure that everything works. You’ll see the JSON object as string in the browser window. In fact we can even leave out the set method in this case and Express will infer from the object type that we’re sending back a JSON object. However, the set method can be used to put other headers types to the response. 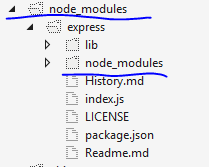 In the next post we’ll look at the module.exports function and controller basics. View all posts related to Node here.